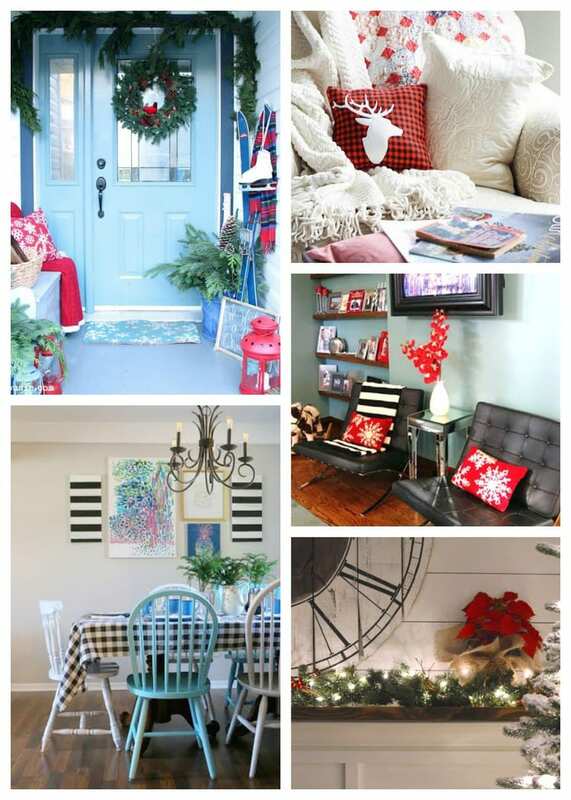 In case you missed my first Holiday Home Tour, please take peek HERE. It’s cold here in Michigan, let’s head inside! First, come on in and have a seat at the dining room table. This years tablescape is full of fresh garland and cranberries. When I saw these white deer candleholders, there was no question I had to have them. These beautiful, old and chippy corbels add an interesting element to the table. The Christmas china? Oh, that’s a thrift store find. My specialty. Before we leave the kitchen, take a peek at my vintage Santa mug and rusty plaid thermal. This thermal is my favorite Holiday find this year. You can see more of our kitchen and living room dressed for the holidays, HERE. Walking through our living room, heading to the formal sitting area, we pass a lovely vignette. It’s a mix of vintage, old and new. Around the tree, is the collar of a thrift store flannel shirt that I’ve up cycled for many projects. Check out my DIY Christmas Garland made from the other pieces of the shirt, HERE. We are now heading into the final room of the tour, our formal sitting room. This was our formal dining room, recently transformed into a sitting area. I love the simplicity of this room. This room is the perfect spot for my morning cup of joe! This vintage Christmas tree is my pride and joy. It sits nicely next to our vintage Radio Flyer. This bulbs were given to me last year by good friend’s mother. Thanks again Fern. They are in good hands! This vintage collage was recently given to me by my neighbor who moved. I think it’s so neat and fits our decor perfectly. I hope you enjoyed our Very Merry Christmas Tour! Happy Holidays! Please, don’t go! 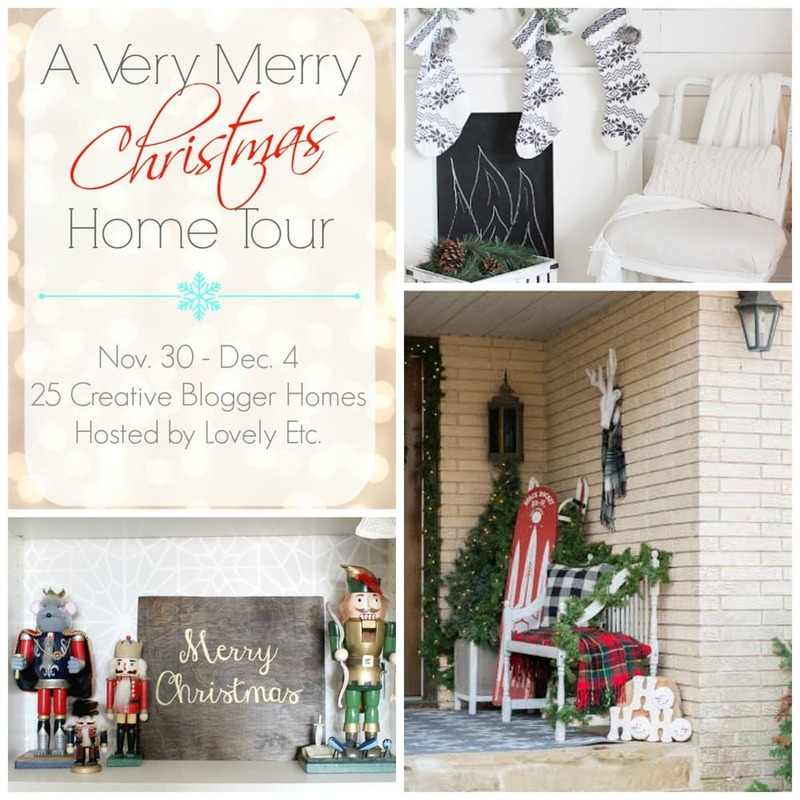 Be sure to visit the rest of the homes on the tour and enter below into the $500 giveaway! Be sure to enter to win $500 CASH! So festive, I love it!! That Jolly pillow is so cute. I love your sitting area! Gorgeous!! I love how light and bright and airy your home is, and the little vintage touches are gorgeous!! Great tour! Thanks Krista! I just love the vintage touches too… I love the history different pieces bring! Happy Holidays! Beautiful! I love all of the red in the home, it feels so cozy! The table is set up perfectly. You are so talented and have a stunning home! You have such a gorgeous home! You Christmas tour portrays such welcoming, cozy vibes and I am loving it. Great style! This is getting pinned. Oooh, your sitting area is perfection! I’m in love! And how gorgeous are all those vintage elements?! They add so much character and charm. Thank you Karen! I love the sitting room too!! My husband still has a heart attack when my daughter runs by them ! LOL I have to keep reminding him that I can watch the slipcovers!!! Love all of the decorations, especially the vintage pieces. And the aluminum tree….so beautiful and so awesome! Gorgeous! The tablescape is perfect … simple and stunning (and your wood table is a gorgeous backdrop)! 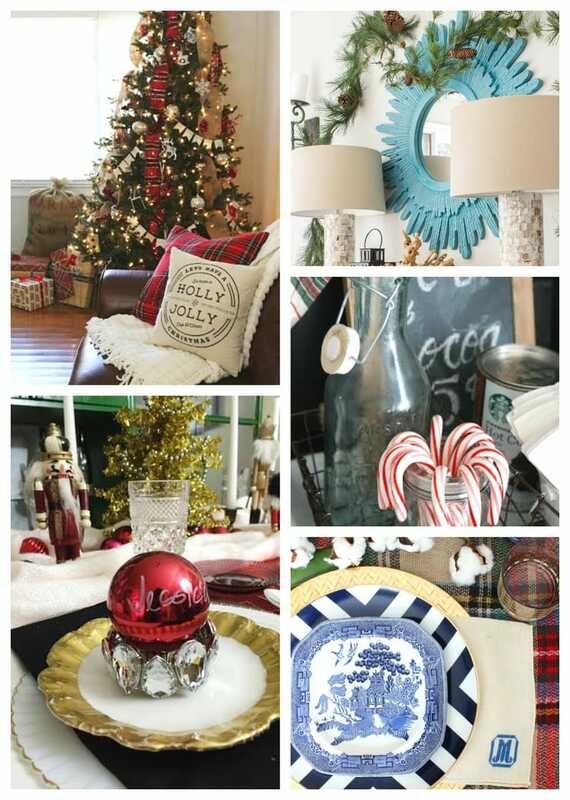 Such a fun Christmas home tour! Also … I SO love that sign in your sitting room. LOVE. Thank you Katie!! I appreciate you stopping by. Happy Holidays! Love the simplicity and coziness? 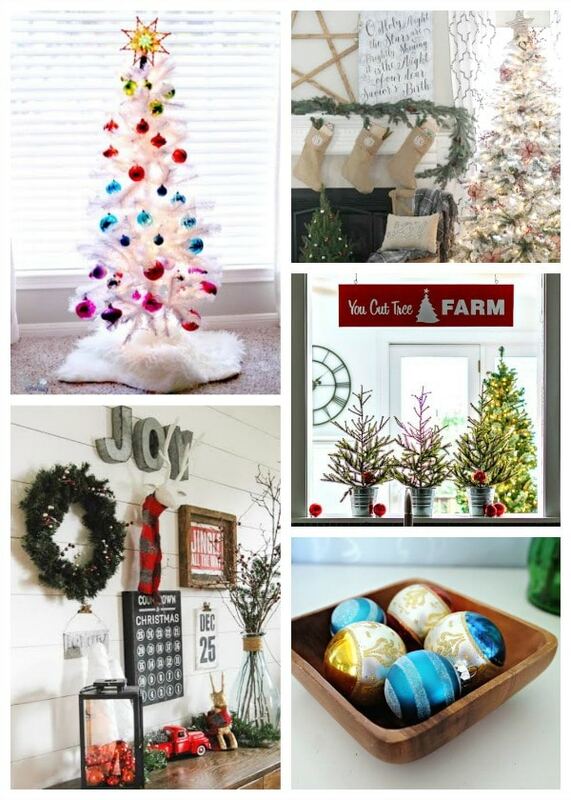 I love all of the beautiful Christmas touches you sprinkled throughout your home! And that vintage tree with the vintage ornaments is so fun! Thanks so much for joining the tour! Thank you Carrie!! I appreciate you stopping by!! Your home tour looks just beautiful! Great giveaway too! I love this and I love your style! Your home is so warm and inviting! Thank you Sara!! I appreciate you stopping by! You have such a beautiful home! It’s so inviting and warm. 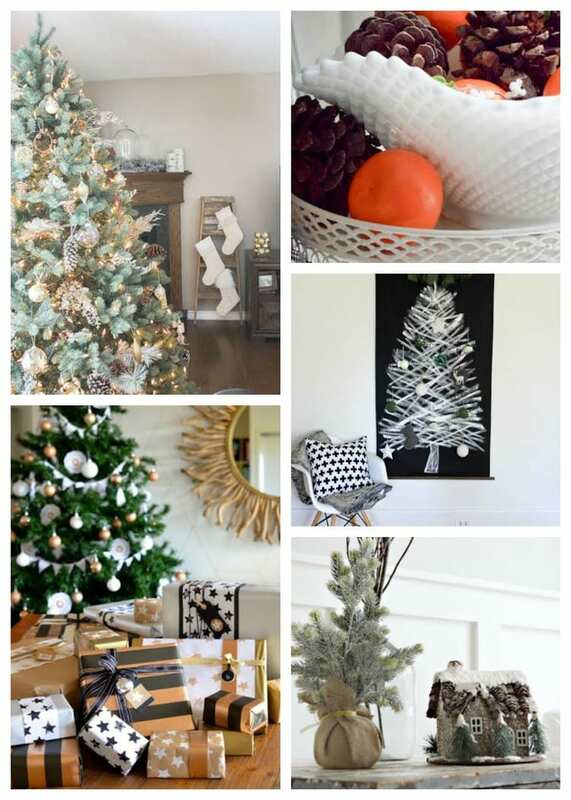 I love the mixture of old and new finds, especially that gorgeous tree with vintage ornaments! Thank you so much Sarah! I love mixing the old and new together! For starters…Your kitchen is Ah-mazing! I love all of your vintage touches and cannot get over that darling little red scooter. Such a beautiful space- I could move right in! Oh THANK you Ariean!!! Thanks for stopping by the blog too. I just adore yours! I am a very new blogger, learning a lot and a lot more to learn! I love your decorating style and how you have turned it into a home that you can relax in. I will be following your blog and maybe you could give me pointers in the right direction! Again thank you for sharing. Thanks so much Linda! Blogging is a lot of work and very rewarding. I glad you joined in the fabulous blogosphere! Feel free to email me if you have any questions. My biggest tip is to network! Where are the white chairs in your sitting room from?